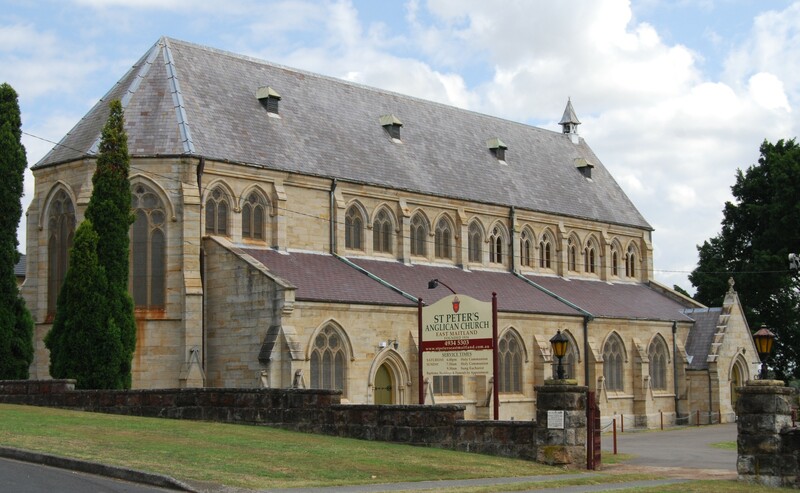 St Peter’s Anglican Cathedral, Armidale, stands just round the corner from its Catholic neighbour. Though both are Gothic in style, their differences are distinctive. St Peter’s was designed by John Horbury Hunt (1838-1904), the Canadian-born original architect of Christ Church Cathedral, Newcastle (begun 1869) on the New South Wales coast and Christ Church Cathedral, Grafton (1881). Hunt favoured brick, an unexpected material for a cathedral, because its relative cheapness ensured that as much as possible could be built with the limited amount of money available. Hunt used local blue brick sourced from clay on the Saumarez estate, with Uralla granite dressings and a scissor-truss roof. Building began in 1873 and after two years the first phase was opened. The vestries and chapter house were added in 1910, and the tower completed in 1938. I visited Armidale to lecture to the local decorative and fine arts society on Chicago. Illustrating skyscrapers in that city, I remarked the Mies van der Rohe’s IBM Tower ignores its surroundings while the earlier Wrigley Building is carefully shaped to fit into its geographical context on the bend of a river – very like, I said, the modern annexes to St Peter’s Cathedral, which blend in a neighbourly way with Hunt’s original design. At the end the gentleman who gave the vote of thanks remarked how pleased he was that I’d mentioned the extensions to St Peter’s Cathedral because he was Tony Deakin, the architect who designed the Parish Hall: http://focusmag.com.au/ne/interviews/tony-deakin. When you address an audience, you never know who’s listening. Mike Higginbottom’s lecture Gothic Down Under: English architecture in the Antipodes explores the influence of British architects, and British-trained architects, on the design of churches and other buildings in the emerging communities of Australia and New Zealand. For details, please click here. This entry was posted in Exploring Australia, Gothic Down Under: English architecture in the Antipodes, Sacred Places, Victorian Architecture on January 27, 2014 by Mike Higginbottom. When I lectured to the Armidale Decorative & Fine Arts Society, I was invited to dinner by Les and Libby in their spacious Gothic Revival apartment, part of the former St Patrick’s Orphanage. This surprisingly late example of Gothic design was built between 1919 and 1921 for the Sisters of Mercy by George Nott, who had previously built Armidale’s Catholic Cathedral of St Mary & St Joseph. By 1924 there were 120 children at the home, cared for and largely educated by the Sisters. The regime at St Patrick’s Orphanage was not, it seems, a bed of roses: http://www.clan.org.au/news_details.php?newsID=568. The orphanage transferred to two cottages in 1976 and eventually closed in 1984. The 1921 building stood derelict for some years, and has now found a happier fate as an opulent apartment-block. There is an image of the building when it was new at http://www.flickr.com/photos/statelibraryofvictoria_collections/6819575484. This entry was posted in Exploring Australia, Gothic Down Under: English architecture in the Antipodes on January 27, 2014 by Mike Higginbottom. Sited in the midst of the Northern Tablelands above the Hunter Valley, Armidale is a strange city to British eyes: it has two cathedrals, a university, and a population of less than twenty thousand. Its oddity to most Australians is that because of its altitude, over 3,000 feet above sea-level, it has seasons, so they call the region “New England”. Many of the early settlers were Irish, and Catholicism has remained a significant force in the community. 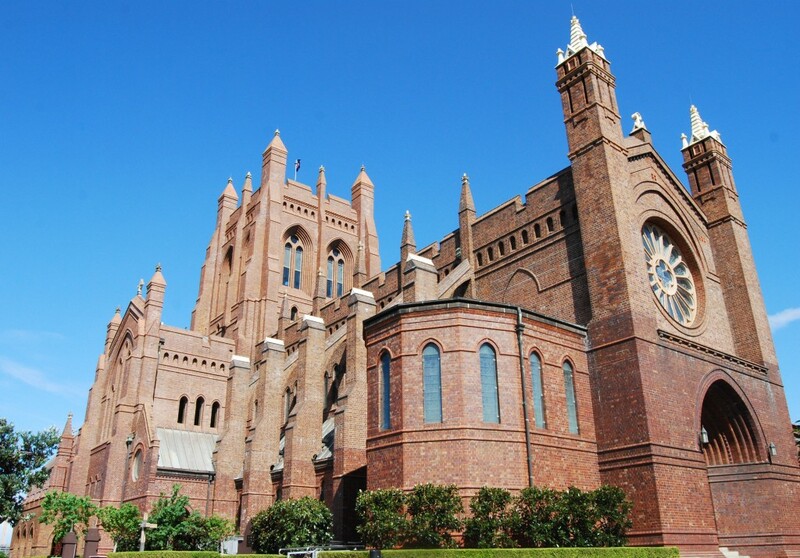 The fine Catholic Cathedral of St Mary & St Joseph was designed by Joseph Ignatius Sheerin (d 1915) & John Francis Hennessy (1853-1924) of Sydney, and built in polychrome brick and Pyrmont sandstone by the Armidale building contractor George Nott in 1911-12. The Anglican George Nott (1865-1940) owned timber mills and brickworks in the area, and supplied the 1.1 million bricks for the cathedral, the largest project of his career. Built in a little over twenty months, it cost A£32,000. Its needle spire, 155 feet high, is a major landmark. 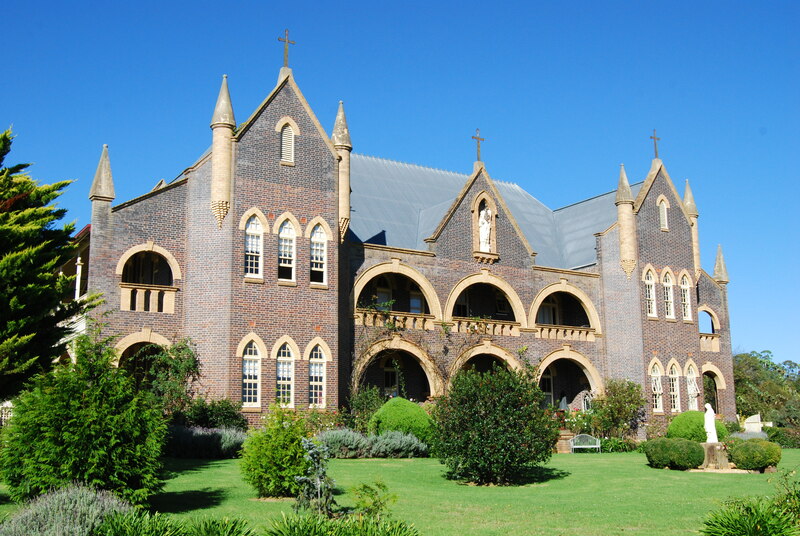 It was one of the last works of the Sheerin & Hennesssy partnership, designers of a series of prestigious Catholic buildings in and around Sydney – the Archbishop’s House (1885) and St Patrick’s Seminary, Manly (1885-1889), St Joseph’s College, Hunters Hill (1884-94), St Vincent’s College, Potts Point (1886), Our Lady of the Sacred Heart Church, Randwick (1888)and the Sacred Heart Monastery, West Kensington, Sydney (1895). 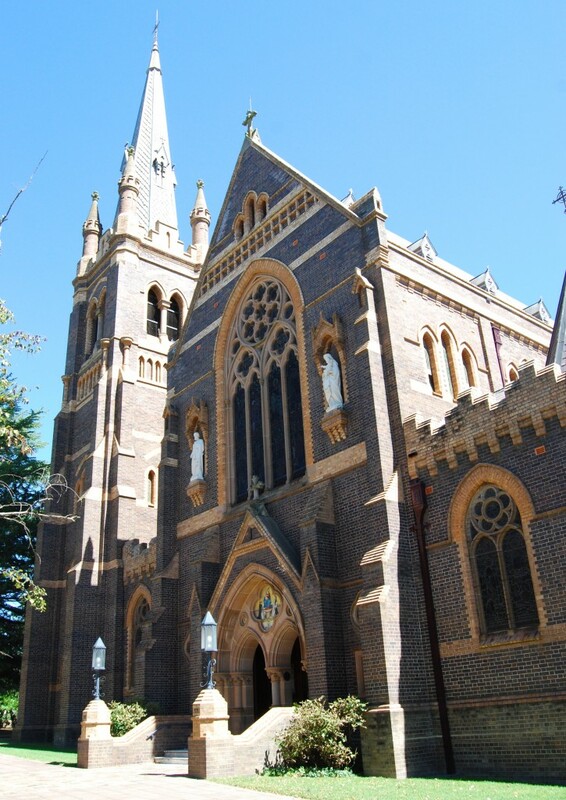 When St Mary & St Joseph’s Cathedral celebrated its centenary, a member of the congregation was George Nott’s daughter, 91-year-old Peggy Becke, wearing the gold chain from the watch that the parishioners presented to her father when the building was completed: http://www.armidaleexpress.com.au/story/410529/armidale-catholic-cathedral-turns-100. The final church that Phil and Jane Pullin showed me when I stayed with them on my ADFAS tour is a contrast to Edmund Blacket’s other churches in the area. 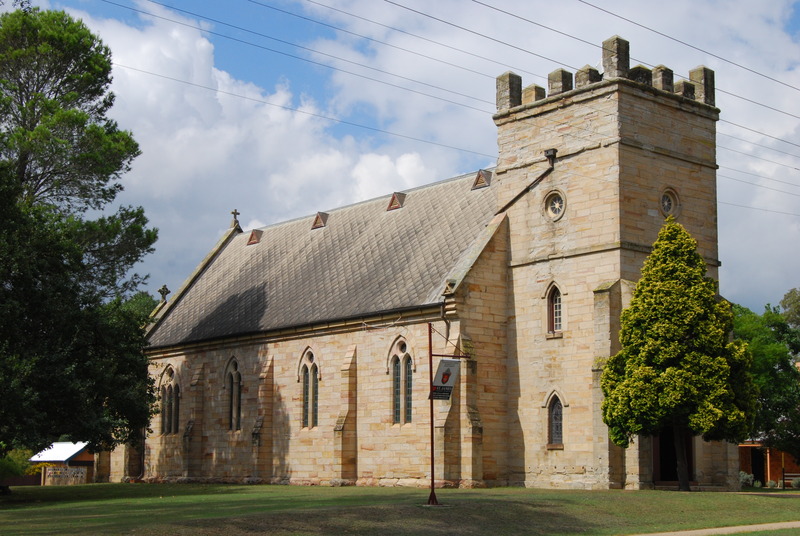 Whereas St Mary’s, West Maitland and St Peter’s, East Maitland replaced earlier functional buildings, St James’ Church, Morpeth [http://www.stjamesanglicanchurchmorpeth.com.au/page/315332271] is Blacket’s 1860s adaptation of an existing building of 1837-40: he added the sanctuary and sacristy and designed the font and pulpit. It was rebuilt by John Horbury Hunt after a fire in 1874: he raised the nave walls and devised the lightweight hammerbeam roof, but left the tower at its original height so that it now looks undersized. The organ (1877) is a rarity, one of the few surviving instruments by the Sydney organ-builder William Davison. St James’ has two fine statues, of St James and the Virgin Mary, by the sculptor Englebert Piccolrauz (b 1942). All this I would have missed as a tourist. It makes all the difference to spend time in a foreign country working and receiving the hospitality of people who’ve lived there all their lives. And in the Hunter Valley coalfield of New South Wales, with its Tyneside place-names, there is a constant reminder to a Brit that Australia is, in many respects, remarkably like home. This entry was posted in Exploring Australia, Gothic Down Under: English architecture in the Antipodes, Sacred Places, Victorian Architecture on January 25, 2014 by Mike Higginbottom. St Peter’s Church, East Maitland (1875-85) was designed by Edmund Blacket in 1875 and built 1884-6 under the supervision of his son Cyril (1857-1937). It is more ornate than St Mary’s, West Maitland, but lacks the intended 180-foot-high tower and spire, so that the west wall is blank apart from a clearly temporary doorway. Another aisled church, built of local sandstone, it has an apsed east end has three traceried windows. The interior columns are granite capped with Melbourne bluestone basalt. St Peter’s has a fine Willis organ of 1876, installed in the church in 1886: http://www.ohta.org.au/confs/Sydney/STPETERSANGLICAN.html. In the years after its completion St Peter’s was richly embellished by local benefactors. The very fine alabaster and marble pulpit by Rhodes of Birmingham dates from 1893; the reredos is made of Oamuru stone from New Zealand, with red Girotte marble shafts from the Pyrenees and Ashburton marble from England; the lectern dates from 1897, and the floor was tiled in 1900-4. Blacket’s tower will presumably never be built, yet St Peter’s is as fine and impressive a Victorian church as any you could find in Britain. Phil and Jane Pullin were my final Australian Decorative & Fine Arts Society hosts, when I lectured to the Pokolbin DFAS. I warmed to them immediately because, when I texted to say I was stuck on a train with no buffet, they greeted me on the platform with a bottle of water and a chicken sandwich. They were also enormously helpful in filling my free time with visits to a collection of Victorian Gothic churches in around the amalgamated towns of Maitland and Morpeth, which lie at the tidal limit of the River Hunter and became an important junction on the Great Northern Railway between Sydney and Brisbane. The modern city of Maitland is a good place to see the work of the English-born, self-taught Australian architect Edmund Blacket (1817-1883), who is best known for his St Saviour’s Cathedral, Goulbourn, New South Wales (1884) [http://en.wikipedia.org/wiki/File:GoulburnStSaviour%27sCathedral.jpg], St Andrew’s Cathedral, Sydney (1868), and the Great Hall and Quadrangle of the University of Sydney (1861) [http://en.wikipedia.org/wiki/File:SydneyUniversity_MainBuilding_Panorama.jpg]. He was the mentor of other major nineteenth-century Australian architects such as John Horbury Hunt (1838-1904). Blacket is regarded as a safe, conformist architect, who seems to have been most comfortable designing small parish churches. In fact, some of his parish churches are quite grand. St Mary’s Church, West Maitland (1860-7) is a spacious, gracious, aisled church with twin porches and a tower added in 1880, two years after the church was consecrated. Built of local Ravensfield stone, its oddity is the undersized west window, which lights the west gallery in which the 1881 Willis organ was placed in 1959: http://www.maitlandanglican.com.au/index.php?option=com_content&view=article&id=49&Itemid=56. 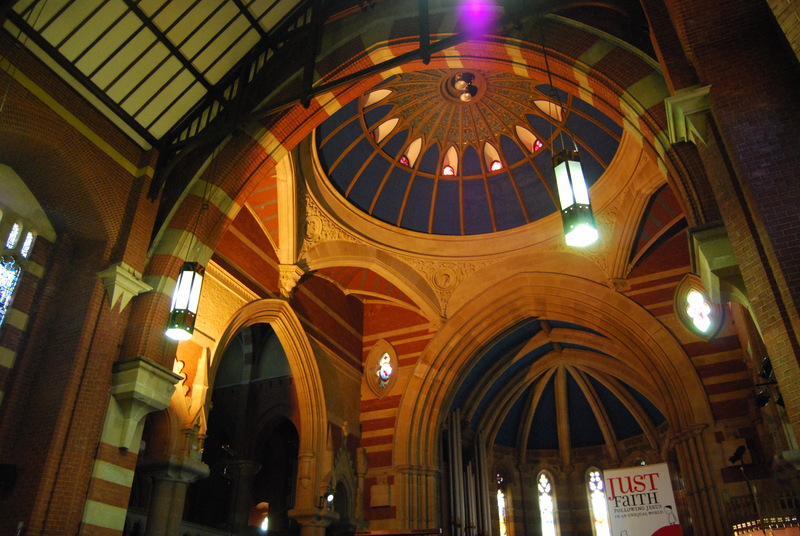 The plainer, brick sister church, St Paul’s, West Maitland (1858) is also by Edmund Blacket. Its detached bell tower of 1888 was part of an uncompleted enlargement plan. 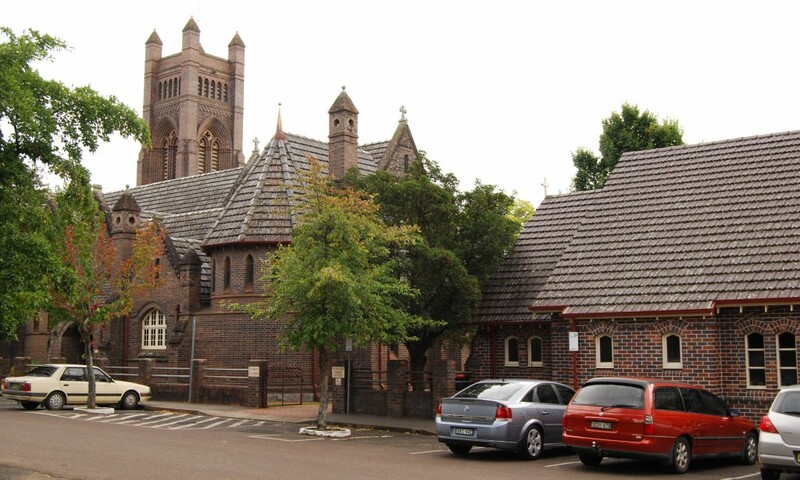 It is now deconsecrated: http://www.maitlandanglican.com.au/index.php?option=com_content&view=article&id=50&Itemid=57. Every major Australian and New Zealand city possesses at least one, usually two, fine cathedrals, many of them started in the Gothic Revival style in the early years of settlement. 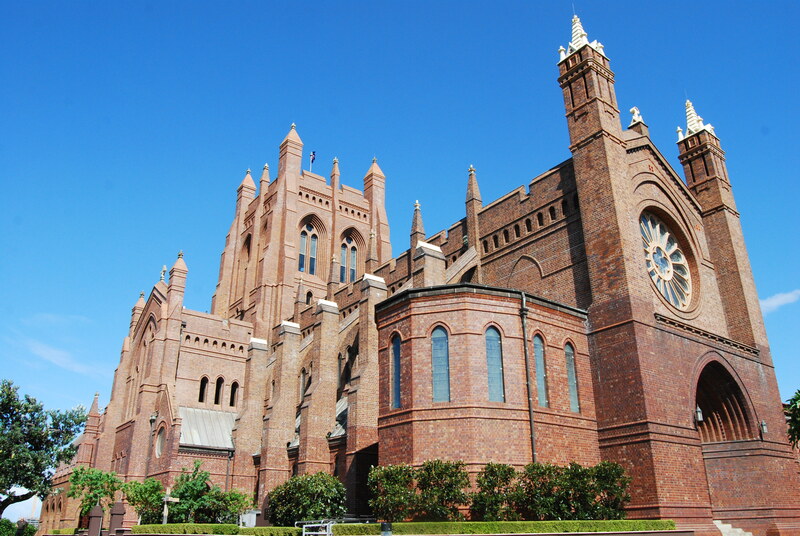 Some, such as St Mary’s Roman Catholic Cathedral, Perth and Holy Trinity Cathedral, Auckland, were completed to newer, cheaper, more practical designs; others such as William Wilkinson Wardell’s magnificent St Patrick’s Cathedral, Melbourne, and St Mary’s Cathedral, Sydney, were eventually completed as the original architect intended. The Cathedral Church of Christ the King, Newcastle, New South Wales, begun in 1869, is a superb essay in Gothic Revival style by the Canadian-born architect John Horbury Hunt (1838-1904), who designed (among much else) Christ Church Cathedral, Grafton (1881-4), St Peter’s Anglican Cathedral, Armidale (1871) and rebuilt the charming little church of St James, Morpeth after a fire (1874-7) – all three in New South Wales. The original design by the architects Leonard Terry (1825–1884) and Robert Speechly (1840-1884) proved unworkable, and John Horbury Hunt provided a new design in 1882. It has the signature of this talented, often controversial architect – an uncompromising choice of materials, in this case brick, and a forthright acceptance of asymmetry. The building as it stands is not exactly as John Horbury Hunt intended: http://www.flickr.com/photos/uon/4128635375/in/photostream. Construction stalled in 1893 in a flurry of litigation over contracts and costs, and resumed in 1900 under the supervision of the Sydney architect John Hingeston Buckeridge (1857-1934), so that the nave and crossing could be brought into use in 1902. Thereafter, a succession of architects progressively extended the building: Frederick George & A C Castleden designed the Warrior’s Chapel (1924) at the east end, using Buckeridge’s plans, and the nave was completed with a roof unlike Hunt’s intention in 1928. E C Sara of the practice Castleden & Sara added the Columbarium in 1955. Eventually, in 1979, the transepts and tower were completed, largely according to Hunt’s intentions, by E C Sara’s son John. The only omission from the spirit of Hunt’s design was the spire, which is almost certainly for the best, because the Cathedral was damaged in the 1989 earthquake, and the repairs that took place in 1995-1997 were only practicable because of the quality of the original structure: http://www.newcastlecathedral.org.au/earthquake.html. The result is a magnificent, remarkably harmonious essay in Gothic architecture, completed in the 1970s and rescued in the 1990s. At the time of its consecration in 1983 it had been in use for eighty years. I was fortunate to be shown round by Bronwyn Orrock, who has inventorised the cathedral’s many treasures, including sixty stained-glass windows by Kempe & Co and one, the Dies Domini window of 1907, by Edward Burne-Jones and Morris & Co. The font and the bishop’s throne are by William Douglas Caroe (1857-1938); the pulpit is by the German-born artist Frederick Burnhardt Menkens (1855-1910); in the Warriors’ Chapel are fourteen terracotta panels designed by the Doulton ceramicist George Tinworth (1843-1913). The Cathedral is the parent church of Toc H in Australia and is rich in war memorials, from Gallipoli, Flanders, Singapore, Korea, Malaya and Vietnam. Newcastle is, perhaps, off the tourist beat, yet Christ Church Cathedral is one of the most memorable buildings I’ve so far seen in this vast and varied country. The Cathedral website is at www.newcastlecathedral.org.au. This entry was posted in Exploring Australia, Gothic Down Under: English architecture in the Antipodes, Sacred Places, Victorian Architecture on January 24, 2014 by Mike Higginbottom. 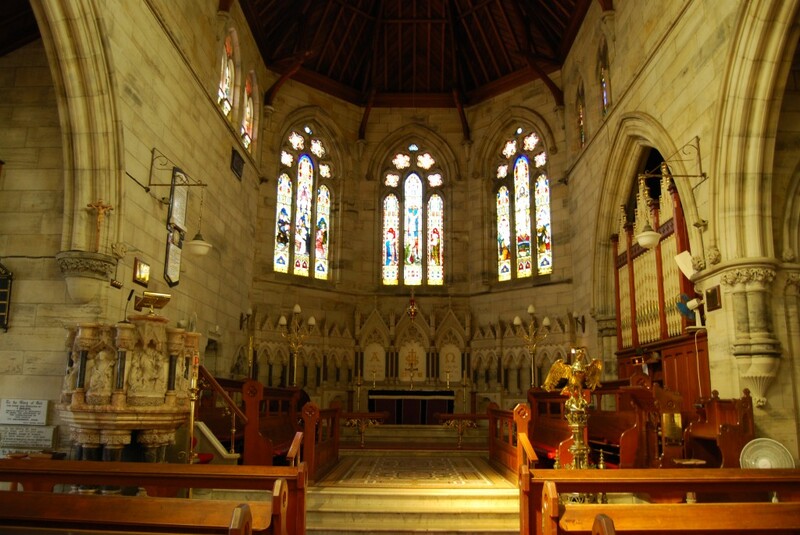 When I lectured to the Camden Decorative & Fine Arts Society, on the south-western outskirts of Sydney, my hostess Nola Tegel insisted on taking me to one of the oldest intact churches in Australia, St Paul’s Church, Cobbitty, which otherwise I might never have found. Cobbitty was developed around the pioneer ranch of Rowland and Elizabeth Hassall, missionaries who arrived in Australia in 1798. 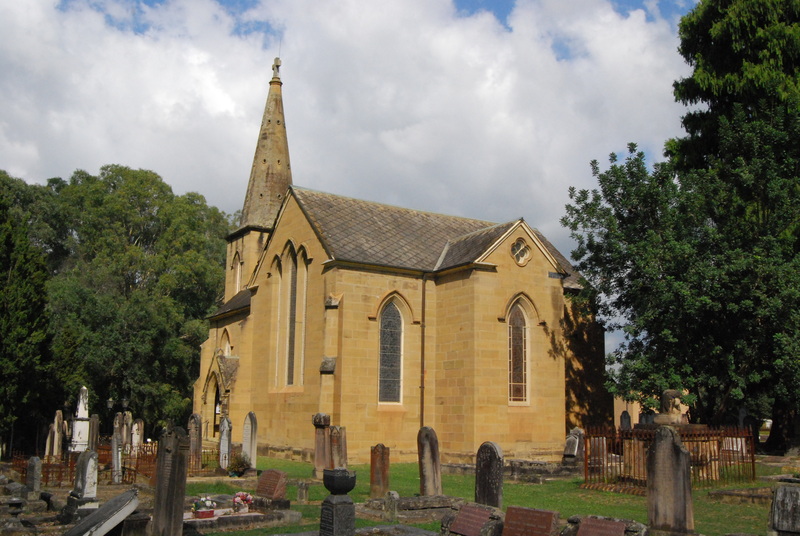 Their son, Rev Thomas Hassall (1794-1868), founded the first Sunday School in Australia when he was nineteen years old, was the first Australian-born Anglican priest and became the first rector of Cobbitty in 1827. He built the Heber Chapel, a simple stone schoolroom dedicated in 1829 to the memory of the much-travelled Rt Rev Reginald Heber (1783-1826), who was Bishop of Calcutta at the time when the whole of Australia was one of its archdeaconries. Known as the “galloping parson”, Thomas Hassall farmed sheep and acted as magistrate while serving a huge parish: http://adb.anu.edu.au/biography/hassall-thomas-2167. The later church, a simple Gothic building with a spire, was designed by John Verge (1782-1861), the English-born architect who is best-known for a series of fine villas in the Sydney suburbs, and was at least partly responsible for Elizabeth Bay House (1835-9). St Paul’s Church was completed in 1842. In the churchyard is the grave of Edward Wise, aged 21, who was struck by lightning while building the steeple. Recent renovations have revealed, so I’m told, that the unusual shape, with a vestigial sanctuary and broad transepts, results from a decision during construction to extend and reorientate the church. The church has one of the very few surviving organs by William Davidson (1876): http://www.sydneyorgan.com/Cobbity.html. Thomas Hassall is buried at Cobbitty, and his family are still linked to the parish: the grandson of his great-great-nephew was christened there in 2011: http://macarthur-chronicle-camden.whereilive.com.au/news/story/path-of-restoration-for-cobbitty-church. Brits used to be sniffy about the lack of history in the former outposts of Empire. In fact, Cobbity has all the history you’d expect in a traditional English village – buildings going back to the roots of the settlement, fascinating characters, archaeology, and family links back to the Australian equivalent of the Norman Conquest: http://www.dictionaryofsydney.org/entry/cobbitty. This entry was posted in Exploring Australia, Gothic Down Under: English architecture in the Antipodes, Sacred Places, Victorian Architecture on January 22, 2014 by Mike Higginbottom. My only chance to see the scale of Tasmania was a bus-journey from Hobart north to Launceston (pronounced Laun-ces-ton with three syllables) – an enjoyable journey following by road an entirely serviceable railway track that hasn’t seen a passenger train since 1978. My curiosity was aroused by odd places I’d have stopped at if I’d been in a car – Oatlands, its early-nineteenth-century sandstone buildings constructed by convicts, Callington Mill (1837) the only functioning Lincolnshire windmill in the southern hemisphere [http://www.callingtonmill.com.au/mill], Perth, which has a dignified octagonal Baptist church and a rather sad locomotive “plinthed”, as the website describes it, in a park: http://www.australiansteam.com/H6.htm. The Launceston Decorative & Fine Arts Society booked me into the splendidly named Clarion City Park Grand Hotel [http://www.clarionhotel.com/hotel-launceston-australia-AU738] and made sure I didn’t starve: I like to sample southern-hemisphere fish, so at lunch I ordered gummy and potato salad at Silt @ Seaport [now apparently closed – http://www.tripadvisor.co.uk/Restaurant_Review-g255344-d1652423-Reviews-Silt_Seaport-Launceston_Tasmania.html] and after the lecture I was taken for dinner at a carnivore’s nirvana, the Black Cow Bistro: http://blackcowbistro.com.au. I liked Launceston, where I had a free morning before flying back to Sydney. The shopping streets are particularly rich in Art Deco buildings. My particular favourite building, however, was St John’s Anglican Church, a weird pot-pourri of different building phases – a “Regency Gothic” tower dating back to 1830, the chancel and transepts added according to an unfinished plan by the Huddersfield-born architect Alexander North (1848-1945) between 1901 and 1911, with the nave enlarged, again by Alexander North, in 1937-8. North’s splendid crossing is spanned by a concrete dome, but the massive central tower remains unbuilt. At the time I visited St John’s I didn’t realise – there’s no reason why I should – that the organ was first installed by Charles Brindley, organ-builder of my native Sheffield, in 1861: http://www.ohta.org.au/organs/organs/LauncestonStJohns.html. It seems that Brindley, together with his eventual business-partner, Albert Healey Foster, exported organs to the southern hemisphere on a regular basis. 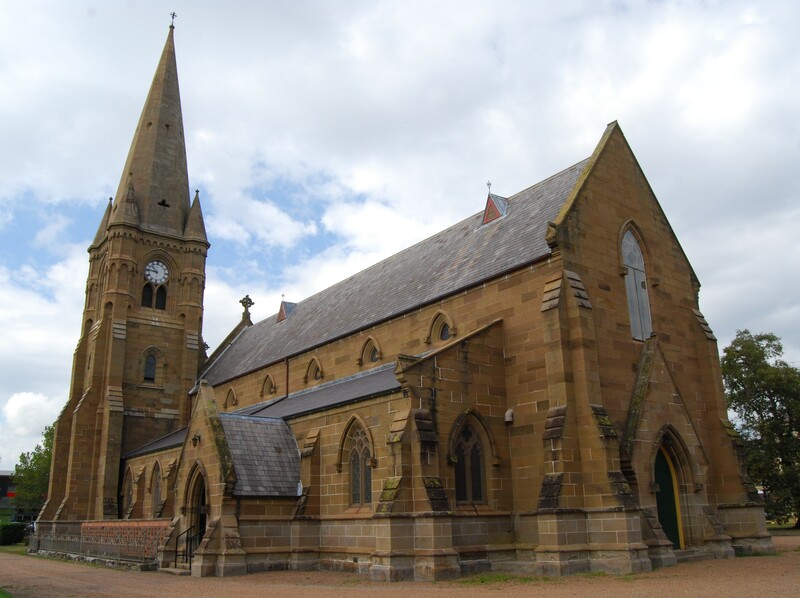 This entry was posted in Exploring Australia, Gothic Down Under: English architecture in the Antipodes, Sacred Places on January 20, 2014 by Mike Higginbottom.